I hope that 2008 is treating everyone absolutely stunningly. After nearly a month of recharging my batteries in the States (Clipsburgh Pistolvania Represent), I have returned to school with both a new lease on life and a new blogosphere bandwagon that I have jumped on. As previously referenced in passing, I am very much enamoured with Vampire Weekend, a highly talented and unfortunately named band. 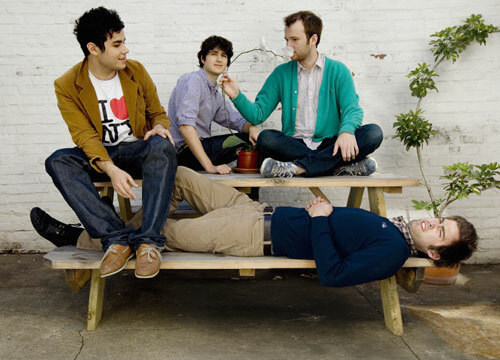 While the name of the band sounds like it was taken off of the front of a Hot-Topic bestselling T-Shirt, Vampire Weekend crafts an incredibly catchy mix of pop melodies and African harmonies. The lyrics of the band’s XL debut (due out Tuesday) read like the life-and-times of a priveliged New England 20 something WASP struggling with love and lust (Did I mention the band met at Columbia?). If that description doesn’t spark any intrigue, I’ve got nothing for you. Check out “Cape Cod Kwassa Kwassa” and “Walcott” below, and expect more frequent updates from the Blogosphere Bandwagon coming soon. This album is getting big. Nice spot DK.